You can’t just buy some powder or a can of gravy and call it gravy. That’s not gravy. Use this recipe for homemade beef gravy to make potatoes or most meats into a fantastic version of the same meal. Beef drippings. Beef drippings are just what’s left after making a roast. So you may have to make a roast. Beef broth. I’d recommend homemade beef broth, but you can use the canned stuff if you’d like. After you’ve made your roast beef, remove the meat from the pan and put it away safely. You should probably eat it at some point. Pour all the juices in the pan into a large bowl. Let it sit for a bit. The fat will rise to the top as the juice settles. Remove as much of it as you can before proceeding. Pour the beef drippings back into your roasting pan. Add two cups of beef broth and set the heat to medium. Use a wooden spoon to stir the drippings up and stir it around the pan. Mix the drippings and the stock as well as you can. Add two tablespoons of corn starch to a small bowl. Add four tablespoons of beef broth to the corn starch and whisk it until you have a paste. Nothing crumbly, just paste. If you add this to the drippings in the pan before getting it down to a clean paste you won’t be able to do it later. Add the paste to the pan with the drippings and the additional broth. Whisk until everything becomes thick, smooth, and gravy-like. You can use wine in place of some of the stock. A lot of gravies for fancy meals incorporate wine. Use red wine for beef or white wine for poultry. Ensure you remove as much fat as possible before proceeding. Even after you have finished making the gravy the fat will settle on top. It makes your gravy look terrible. 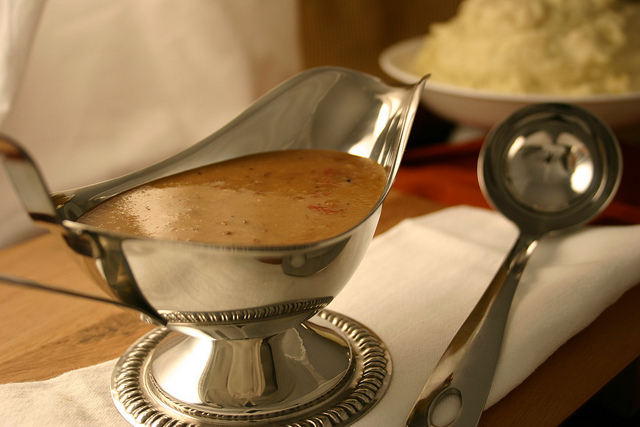 You can use bouillon in place of the drippings if you want a less authentic but more accessible gravy.